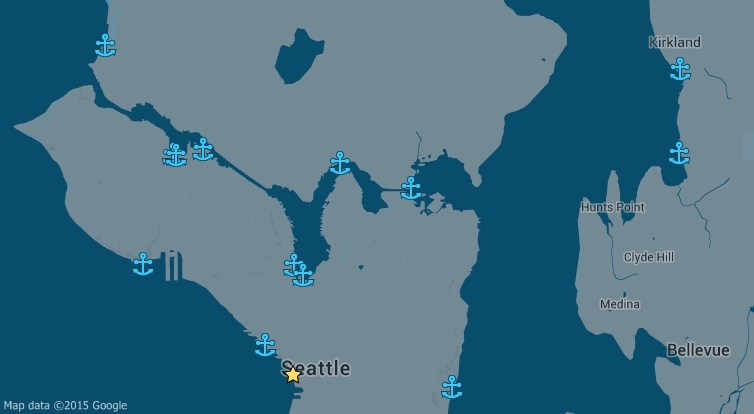 View a detailed list of ALL of our Private Charter docks across the Puget Sound. Want your Private Charter to cruise out of a dock not listed below? Inquire with one of our Sales Executives - click here. We recommend parking at the Art Institute of Seattle (directions). Once at Bell Harbor, walk through the Marina Office and take the elevator or stairs to the water level. Our vessel will be in the charter slip at the end of the dock. There is free parking at Fishermen's Terminal! Check the parking lot signage to ensure you are parking in a space that allows for enough time. The access streets to reach Ewing Street are Nickerson and 13th Avenue West. 1270 Carillon Point, Kirkland, WA 98033 (Near the Woodmark Hotel). Please Note: this dock is a different location than the Kirkland City Dock. There is parking on-site at Carillon Point. Click Here for more info on parking. *Please note Carillon Point's Special Event parking rates.